JET Collective – An eclectic and accomplished blend of contemporary jazz, pop and folk, with influences ranging from Dave Brubeck and Jan Garbarek to Santana. 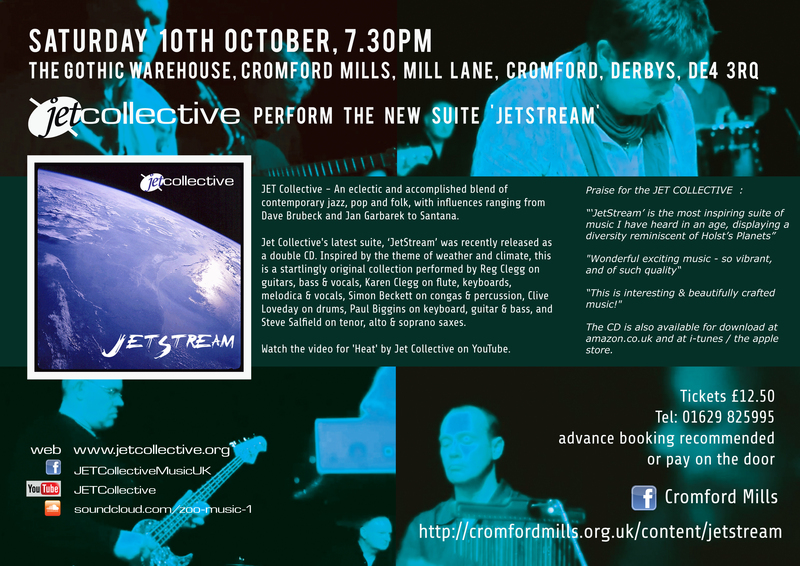 Jet Collective’s latest suite, ‘JetStream’ was recently released as a double CD. Inspired by the theme of weather and climate, this is a startlingly original collection performed by Reg Clegg on guitars, bass & vocals, Karen Clegg on flute, keyboards, melodica & vocals, Simon Beckett on congas & percussion, Clive Loveday on drums, Paul Biggins on keyboard, guitar & bass, and Steve Salfield on tenor, alto & soprano saxes. or pay on the door. There will be a licensed bar. New and original contemporary jazz collaborations, performances and recordings from the East Midlands group of musicians.